I truly enjoy Women & Creativity each year - and it&apos;s not only because I am one of the coordinators. It&apos;s because I love the connection of so many artists, organizations, women-owned businesses in our community. I love attending workshops, exhibits, book readings, and performances. I love being reminded that there are countless ways to be creative. I love being impressed by the number of creative and passionate women in our community. Each March, Women & Creativity offers a month-long celebration of women&apos;s creativity and entrepreneurship across creative fields presented by more than 20 community partners including and 120+ artists, presenters, and performers. It was one event that sparked Women & Creativity. That spark was "Mujer y Canto" at the National Hispanic Cultural Center, organized by Lucinda Lucero Sachs in 2003. A small audience spent an afternoon in NHCC&apos;s small theatre where talented Latinas with diverse gifts took the stage one at a time - an essayist, a poet, a curandera, and a belly dancer. There was no major theme, just talent, passion, and creativity shared enthusiastically. It was a magical afternoon. That magical afternoon inspired me to launch Women & Creativity which has led to almost a decade of collaboration, partnership, creativity, learning, connection, and community. There are so many events and workshops to enjoy, but here are a few examples! Tete-a-Tete Artist Trading Cards. This is a fabulous project and you can participate wherever you are on your own timeline. Here&apos;s how it works: You submit your request to play at www.womenandcreativity.org by March 15. We mail you 10 blank trading cards. You beautify those cards - with paintings, prints, drawings - whatever you see fit. Mail them back by April 8. We shuffle all the submissions we receive and mail you a deck of 10 original trading cards, beautified by creatives from all over the place. Four Poets respond to the Apron Project: "Womyn&apos;s Work"
Four Poets Respond (created by Valerie Martínez) is poetry-as-performance that responds to works of art, earth and issues important to women. Each year four female poets come together to write, collaborate, and then compose and perform an original poetic piece. Four Poets embraces ekphrasis, eco-art, collaboration, spoken word performance, and has quickly become a popular series of performances in New Mexico. 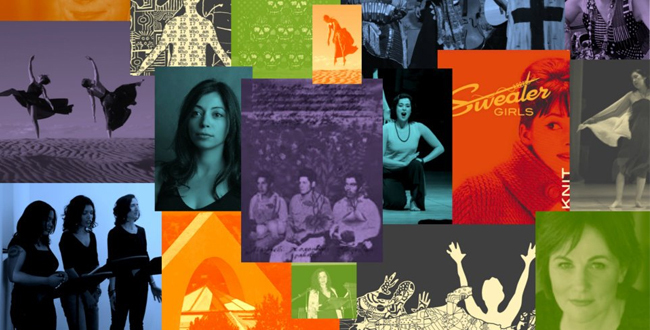 Attend the late-night cabaret and community gathering at the Tricklock Performance Laboratory for wild and unpredictable performances featuring women performers, musicians, and more! Recommended for mature audiences. 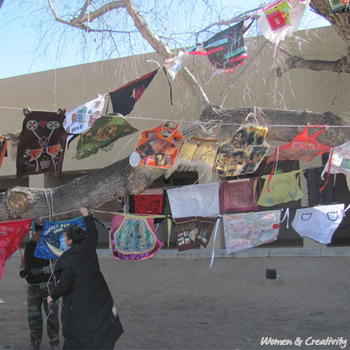 Women & Creativity is coordinated by Dr. Shelle Sanchez of the New Mexico Department of Cultural Affairs, Julia Mandeville of the Harwood Art Center, and Valerie Martinez of Littleglobe.